Times have changed. 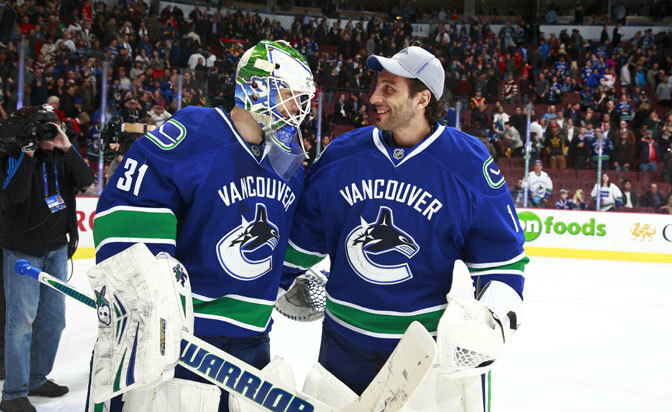 Roberto Luongo is no longer with the Vancouver Canucks and Eddie Lack suddenly has the crease all to himself. Luongo was traded to the Florida Panthers in a package that sent goalie prospect Jacob Markstrom to the Canucks. Markstrom could wind up competing for playing time, but he has dealt with injuries and been playing for San Antonio of the American Hockey League for much of this season. Lack, a first-year NHL goalie, starts Tuesday against the Phoenix Coyotes and will do his best to keep a struggling team afloat in the Western Conference Stanley Cup Playoff picture. Lack has allowed two goals or fewer in 17 of his 25 appearances and started the 2014 Tim Hortons NHL Heritage Classic on Sunday over Luongo. Luongo returns to the Panthers, for whom he played 317 games from 2000-01 to 2005-06. With the Canucks, Luongo was consistently among the top 10 League-wide in wins and helped the team to a Stanley Cup Final appearance in 2010-11. If he remains in Florida for the remainder of his contract, he can be part of the long-term solution. For now, Luongo joins Tim Thomas in Florida, which could spoil Luongo's short-term value for fantasy owners. His stock was already on the decline, and joining the Panthers, who are near the bottom of the League in goals per game (2.36, T-25th), will not help, especially if he and Thomas split time down the stretch (Editor's note: Thomas was traded to the Dallas Stars on Mar. 5). Florida is near the bottom of the Eastern Conference and dealing with an injury to top-line center Aleksander Barkov. The trade comes less than a year after Cory Schneider was sent to the New Jersey Devils at the 2013 NHL Draft. Schneider, who posted the best goals-against-average (2.09) and save percentage (.931) League-wide for any goalie with more than six appearances from 2010-11 to 2012-13, was locked into a timeshare situation with Luongo before he was traded. Now, with Luongo and Schneider out of the picture, this is Lack's job to lose. The 26-year-old (21 percent owned in Yahoo leagues) should be added in all deep leagues and at least considered by owners in more shallow formats based on how he fares over the next few games.